When 1,200 houses were proposed to be built on 1,035 acres of undisturbed open space, Draper City asked The Trust for Public Land for help saving the land. The property extends from the city up into Corner Canyon and is the city's backdrop and sense of identity. The streams flowing through Corner Canyon provide clean water to drink for the community and the rugged terrain is a popular challenge for hikers, horseback riders, and mountain bikers. Working together, TPL and Draper City placed a conservation measure on the ballot to help raise funds to save the land. Residents passed it overwhelmingly, agreeing to raise their property taxes to keep this important landscape and their drinking water intact. 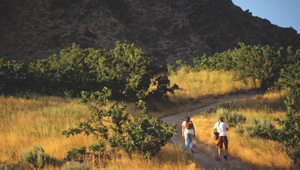 Now protected, Corner Canyon expands the Bonneville Shoreline Trail, connecting it to the many established trails that crisscross the property.